Discover what your body's basic caloric needs are to determine a nutrition and exercise action plan that fits your unique needs! Resting Metabolic Rate (RMR) refers to the rate in which the body uses calories needed for pumping blood through the body, inhaling and exhaling air, maintaining body temperature and various other processes necessary for life. With the KORR System, resting metabolic rate can directly be measured and the results can be used to create personal nutrition and exercise action plans to facilitate weight loss or weight maintenance. You will have a breathing tube placed inside the mouth, and a nose clip over your the nose. 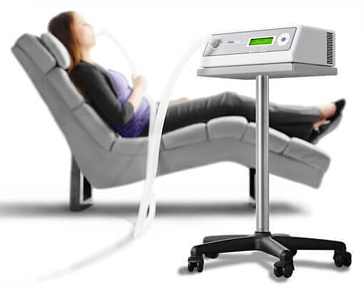 We will measure the air you exhale while you lie down in a comfortable position in a dimly lit room. The breathing tubes are connected to a sensor and computer that measure the air exhaled while conducting the test. For accurate results do not eat or drink or exercise for 12 hours prior to the assessement. The best time for this assessment is early morning shortly after you wake up. The full RMR assessment takes approximately 1 hour. Schedule a RMR Assessment Today!